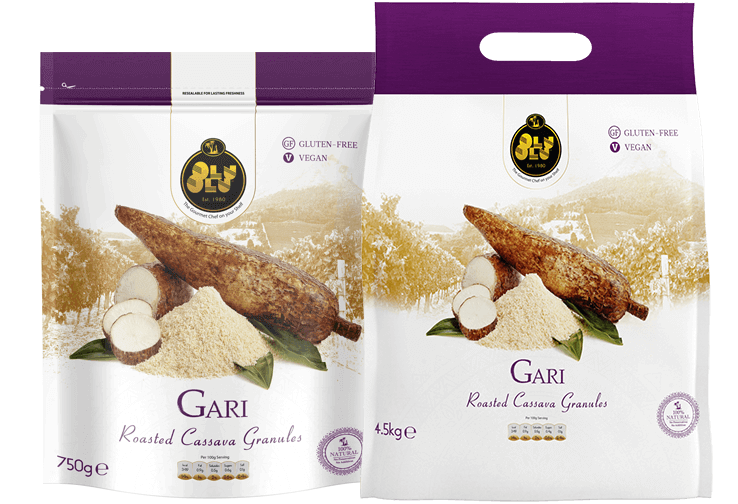 This is our Signature Flour Blend of Instant Pounded Yam flour specially formulated with organic and all natural flours and starch; primarily used to make a traditional Nigerian meal called Pounded Yam. Enjoy its subtle natural flavour, smooth velvety texture and rich taste. 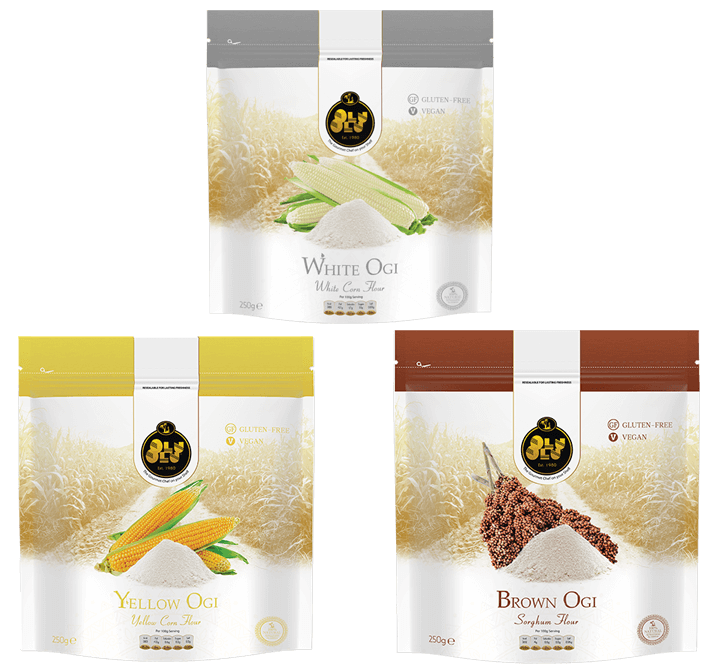 Olu Olu’s pounded yam flour has grown to become the definitive number 1 Pounded yam flour on the market. 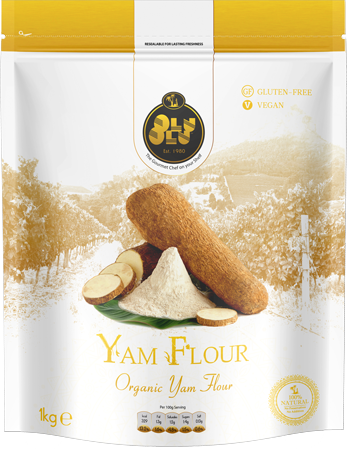 Yam Flour, Yam Starch, Potato Flour, Rice Flour and Potato Starch. 1. Bring 1½ cups (450ml) of water to boil in saucepan. 2. Lower the heat and with a wooden spatula stir 1 cup (240g) of flour into the boiling water and knead till lump-free dough is achieved (approx. 2 mins). 3. As you stir, a glutinous mass in the shape of dough will form. 4. Add ¼ cup (75ml) of milk or water (and a little flour - if required) and knead again for 1 minute then reduce heat to the lowest and leave to simmer for 3 minutes (cover with lid). 6. Remove dough from saucepan and leave to chill on plate for 1min. Serve with Stew, Gravy, Bolognese or Sauce of choice. 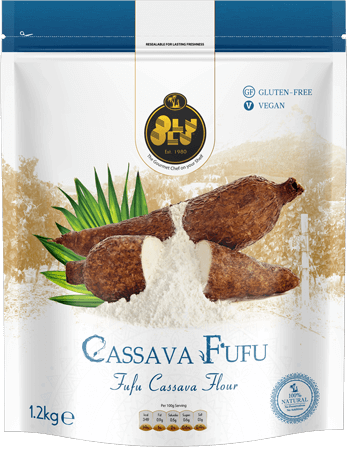 Olu Olu® Cassava Fufu Flour offers premium quality, rich authentic flavour and a fine texture that's unrivalled on the market. The cassavas, which are grown across Nigeria, are peeled, washed, cut into pieces and then left to soak in spring water for a few days before sun drying. This results in sun-ripened, nutrient rich cassavas that are fermented and milled into fine flour. 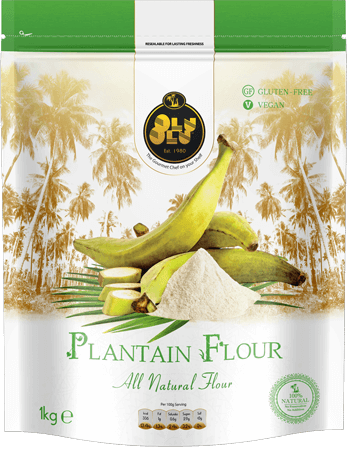 Olu Olu® Plantain Flour is a delicious and all-natural, pure flour produced from organic green plantains, which are grown across Colombia and Nigeria. The peels of each plantain is removed by hand and the plantains are washed in spring water before sun-drying for that sweet sun-kissed flavour; after which it is milled into flour. There are no added preservatives, colourings or flavourings. 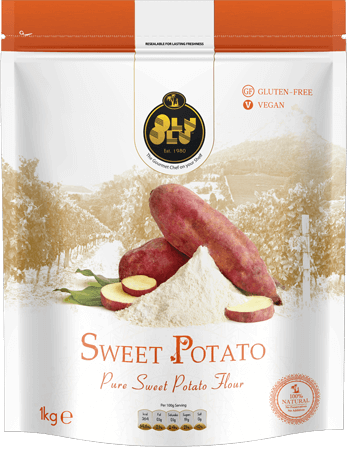 Olu Olu® Sweet Potato flour contains just a single ingredient: Sweet Potato. 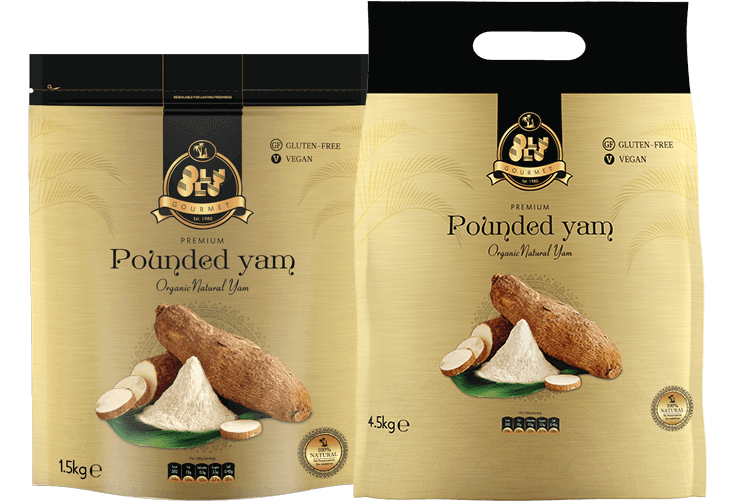 The Sweet Potatoes are harvested from South East Asian soil then drum-dried and milled into fine flour. The result is an all-natural and high quality flour that packs a naturally sweet flavour and plays very well with others in both sweet and savoury dishes. 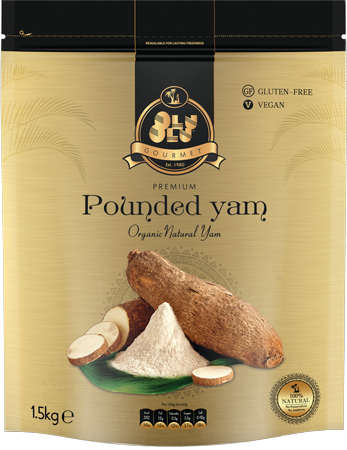 Olu Olu® Yam Flour is produced from organic (non-GMO) yam tubers, which have been grown across the planes of Nigeria. The yams are peeled, washed and cut into pieces. The succulent yam pulps are then left to dry naturally in the sun, so the natural flavours and nutrients are retained. This results in sun-ripened, nutrient rich Yams that are milled into fine flour. 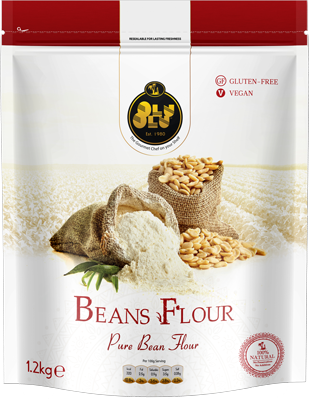 Olu Olu® Beans Flour is produced from beans grown in the most organic conditions, along the southern coasts of Asia. The beans are planted and harvested by hand, and no pesticides or growth enhancers were used during harvest, only natural fertilizers. Our all-natural beans flour is renowned for its smooth texture, natural taste and consistent granular formation; and contains no added preservatives or flavourings. 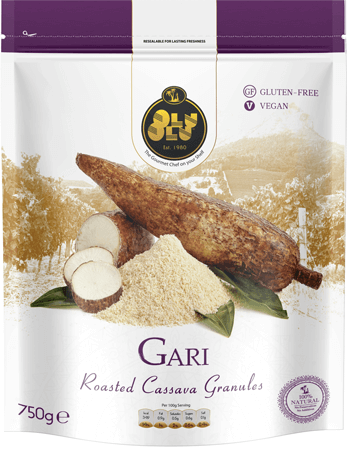 Olu Olu® Gari is roasted cassava granules made from organic (non-GMO) cassava, grown across Ghana and Nigeria. The cassavas are peeled and processed by hand, then sun-dried for that sweet sun-ripened taste; before being milled into grits and finally roasted on an open fire to give it a crispy crunch and deep flavour profile. There are no added preservatives or flavourings. 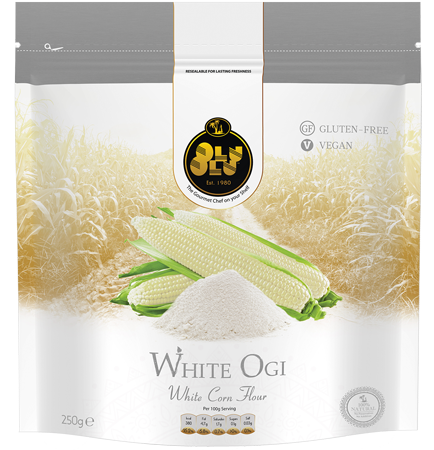 Olu Olu Ogi Flour is fermented corn flour. It is also known as Boboro, Posho, Mswara, Pap or Cou Cou. To produce this flour, the kernels are removed from the cob or them stem in the case of Brown Ogi, by hand. Then washed and left to soak in spring water for a few days allowing the kernels to naturally ferment. The kernels are then sun-dried for a sweet sun-kissed taste; after which its milled into flour. Our Ogi flour is used to prepare ‘injera’ or ‘lahoh’, flatbread that is traditionally eaten in countries such as Morocco, Eritrea, Ethiopia, Somalia and Yemen. It is used to prepare a meal that the South-Africans call ‘Mealie pap’ and Nigerians call Pap. In countries like Bulgaria, Serbia and Macedonia our Ogi flour is used to prepare a meal named ‘Kachamak’ (качамак), and in Romania it’s used to prepare a delicacy called ‘Mămăligă’. In Albania Ogi flour is used to prepare a meal called ‘Arapash’ or ‘harapash’; and its also used all over Europe, especially Italy to prepare ‘Polenta’. In the Punjab province of Northen India and eastern Pakistan its used to make a traditional Punjabi bread that’s often eaten with ‘Saag’ called ‘Makki di roti’. Our Ogi is also gaining popularity in the oriental community where it is used to prepare ‘Corn Congee’ (棒子麵粥) - a porridge that is often eaten with Chinese pickles, and also used to prepare sweet & sour chicken. Other uses for Olu Olu Ogi flour include use as ‘Masa’ or combined with Masa for making ‘Tortillas’, ‘Arepas’ and ‘Tamales’ in Mexico, Colombia, Central America and South America.